And what a year this has been! So much happened just this last month. Lisa and I got married (or here in Maui we say we just got Maui’d) and my GRS surgery is scheduled and paid for. I have just added a separate post including pictures and a transcript of our ceremony. It was a fantastic Hawaiian beach wedding. As you can see in this picture of Lisa and me – we are soooo happy! It was the perfect day, we had 12 guests, beautiful morning at the beach, wonderful spot and we had brunch at the Grand Wailea. The hula band even played a special song so the two of us could have our wedding dance! 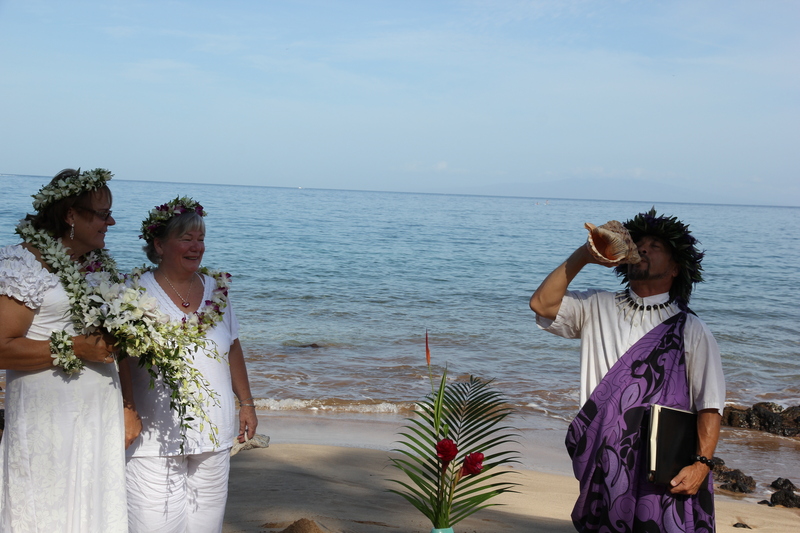 The Hawaiian ceremony was full of symbolism and meaning. I have always dreamed of being the bride at a wedding (well, one of the brides …). So this was very special for me. We were wearing so many flowers – I’m barely visible from under them! Both of us had haku leis (crown lei on our heads) and we wore two leis around our necks (one for our outfit the other to exchange during the ceremony). I also wore a kupu’u lei on my wrist and one on my ankle. To top it all off I had a cascading bouquet that I carried (which my friend from work almost continuously had to hold for me during the ceremony – I hope ‘he’ didn’t mind!). The other major event this month was getting the surgery date confirmed. We sent in the full amount to pay for the surgery, the hotel and spending money as we live there for one month. We have our plane reserved too. Lisa got us in first class on JAL on the way home. I’ll need that as sitting for that length of time is going to be hard. The extra room and comfort will be very welcome right about then. I’m glad that this surgeon keeps his GRS patients for a month. I will feet better and be more able to survive that trip home from Thailand! Plus, if there are any problems, they will more than likely show up before then and they will be able to take care of me. We just received the official wedding certificate, so Lisa was able to change her name on her drivers license and social security. Next we will be going to the passport office and getting that changed for both of us (I had not changed mine yet). Who would have guessed – a hair dryer is ‘not’ for drying your hair – silly men: I added a few more entries in my differences page. Last month I posted about being passable and my comfort level in being out in public. This was the first time my family (brother and sister and significant others) have seen me since I started transition. I was worried how I would be accepted. I was happy with the warm reception I received from my sister and her friend when I picked them up from the airport. The hardest time is when I met them at their resort to go swimming. I wore a two piece, the bottom being a swim skirt. Because of my shape, a two piece is the only way I can get everything to fit properly. I think this might have been a bit much for them at first. As the day wore on, everyone seemed to be more comfortable. The last day my brother and wife were here we went out to what is probably the best most Hawaiian restaurant here on Maui. I wore my long black dress – the one I wore way back when I surprised Lisa when she returned home. My sister and her friend stayed for an extra week. For me, one of the highlights of their visit was taking them out snorkeling and then going out shopping for clothes. This was the first time I ever went shopping with my sister – as her sister! It was precious! Something I will remember. We would find clothes for each other, critic, advise and just had fun. Every trans* person knows that kids (being uninhibited) will be the ones to challenge you. On our wedding day, Lisa and I took the elevator to get to the brunch. A mother and her two little girls were in the elevator and rode down to our floor. Just as the door opened and Lisa and I were getting out, the little girl asks if I’m a woman. Without batting an eye I answered I was. She seemed to accept that and continued to chat away! I impressed myself by the fact that this didn’t bother me in the least. But, you can imagine my trepidation a week ago when I had to teach astronomy to around 210 3rd graders. Only one student sort of kind of asked in a roundabout way if I was a women. Other than that I had a couple of strange looks and heads tipped to the side as they first sat down. To teach 3rd graders, I put together a high energy talk with lots of enthusiasm and great pictures that illustrate events from stellar births in the Orion Nebula to massive supper novas and the mighty explosions in space. Once I start, gender is the furthest thing in their minds. Success to me is measured in how many hugs and high fives I get. By that measure, this year was awesome – even though this was my first time as a woman teaching this class. I even had one student from a different class come back during break to ask me additional questions. Changes this month: except for a few confirmations of being a woman (see above “see, see what’s it like!”) not too much has changed. Lisa and others told me my face has changed some more and people have noticed I have curves. I’ve had a few comments on my weight loss progress too. My breasts have not been sore for a while, but just these last two night a bit of soreness has come back. Oh, breaking news ….. there is a military coup in Thailand. We’ll watch that closely. For now things still look do’able. We are changing our return flight to a bit earlier however. Now to gt back to concentrating on losing weight …. Posted in Diary and tagged Being Female, Gender Change, Hormones, MTF, Transgender, Transgender Wedding, Transition, Transsexual, Transsexual Wedding. Bookmark the permalink. I hope everything goes great!